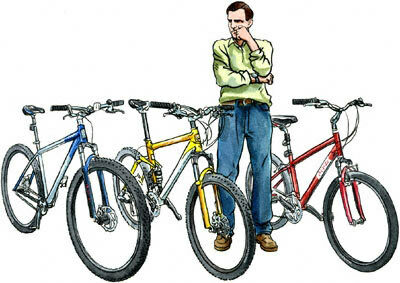 If you’re buying a bike to ride with a group of friends buy something similar to what they ride. Unless you’re super fit, you won’t be able to keep up with road bikes if you’re on a mountain bike or cruiser. And a road bike can’t handle trail riding like a machine made for it. As you learn about the different bicycles available and think about where and how you’ll ride, you’ll start getting a clear picture of the best bike for you. Here’s a quick primer of the different types that are available. Road bikes are fast and easy to pedal on pavement. They’re not as well suited for operating off road. Some people find the low riding position of the racing (“dropped”) handlebars difficult to maintain, comfortably, for a long time. But, there are new road bikes today specially designed to get the dropped handlebars significantly higher so you don’t have to bend over so far. Hybrids or cross bikes are almost as fast and easy to pedal as road bikes, while being almost as comfortable and versatile as mountain bikes. They’re great for commuting, errands, getting in shape and all-around fun. Cruisers (sometimes called “beach cruisers”) are fun to look at and, when ridden at a relaxed pace, are ideal for admiring the scenery, and exploring the neighborhood or shore. There’s nothing we like better than showing off the wide variety of bicycles we offer. And there’s nothing like seeing and riding a few to truly understand the difference and find the perfect bicycle(s) for you! So, drop by soon!